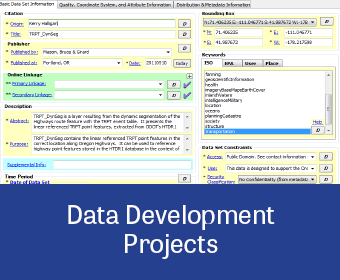 Data development and database design are the foundation of our GIS expertise. Properly collected and organized data is extremely powerful, but getting data in the right format can also be time intensive and intimidating. Navigating through rough data or creating a database is not easy. Our programmers and application specialists are experts at solving geospatial problems. We have proven expertise in designing and developing relational databases specific to natural resources. MB&G has strong enterprise database design, and development skills primarily focused on Microsoft and Esri technologies (SQL Server, SQL Server Management Studio, ArcSDE). We have extensive experience developing geodatabases (file, personal and ArcSDE) which follow Esri’s recommended best practices. Our staff leverage industry leading tools such as ArcGIS Diagrammer for data modeling, EPA Metadata Editor for maintaining FGDC compliant metadata, and Safe Software’s FME workbench for implementing spatial Extract, Transform, Load (ETL) processes. The figure below shows key data development and management tasks in the form of a workflow diagram. Representing these tasks in a flow diagram recognizes their dependencies on preceding tasks and/or their outputs. When clients are developing new data systems these tasks are generally completed sequentially from beginning to end. In the case of system integration, or business process improvement efforts, many of these steps or products may already be completed, and their associated products may already exist. MB&G remains flexible to support our clients in the completion of any or all of these tasks.